These aluminum floor registers offer the durability of steel without the bulky weight. 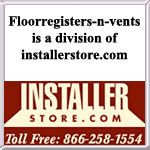 Black vent covers made of aluminum resist corrosion more than cast iron and steel registers. Aluminum floor registers feature a fully operational steel damper. The black vent cover has a scratch resistant powder coat finish. This aluminum floor register is designed with a timeless pattern called Pasadena. This black vent cover is available in 9 different sizes so you should be able to the whole house. Please note the damper on all of the 2" vents will measure 2 1/8" to correspond with industry standards. Note: Aluminum black vent covers ship directly from the manufacturer and may take 10-12 weeks to ship. Tip: To make sure you order the correct decorative floor register you should measure the actual hole size. For instance, a hole size measuring 4" x 12" would need a 4 x 12 register. The faceplate will measure 1 1/2 inches larger approximately, please call for exact dimensions. Want a decorative floor register, but with a different finish or style? Take a look at our many options for you to choose from. We also have matching wall vents for you to create a complete look. These black vent covers will help to bring a unique and elegant look to any room, place your order today!